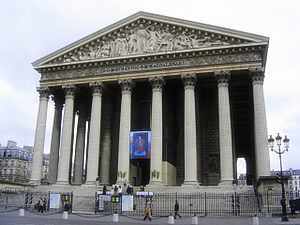 On this walk you will visit the Place de la Concorde, the Eglise de la Madeleine, the Opéra Garnier and the Place Vendôme. The tour begins at the Metro station Place de la Concorde. On the north end of the Place de la Concorde is the Hôtel Crillon and the Hôtel de la Marine. They are separated by Rue Royale. This street will take you to Ste. Marie Madeline. On the south-east corner of the Madeline is a metro station and Blvd. de la Madeline. Walking up this boulevard will bring you to Place de l'Opéra, where there is a metro station. More prominently, however, you will see the Opéra Garnier on your left (north). From here, by walking south on Rue de la Paix, which is just to the west of Avenue de l'Opéra, you will soon come to Place Vendôme. Going directly south through Place Vendôme you will come out on Rue de Castiglione. This street will take you to Rue de Rivloi. From here you can continue straight into the Tuileries Garden, or turn right and return to the Place de la Concorde, where you will find a metro station.